29 available 29 items in stock. This is not your normal Passive Infrared (PIR) sensor! 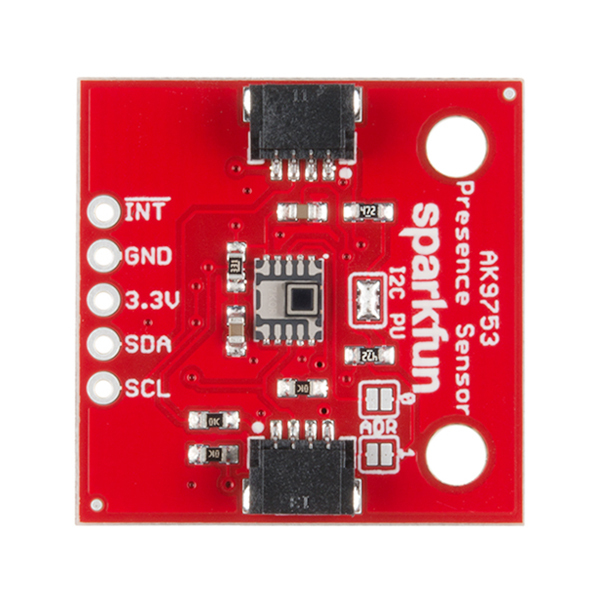 The SparkFun AK9753 Human Presence Sensor Breakout is a Qwiic-enabled, 4-channel Nondispersive Infrared (NDIR) sensor. Each channel has a different field of view, so not only can the AK9753 detect a human, but it can also tell which direction the person is moving. 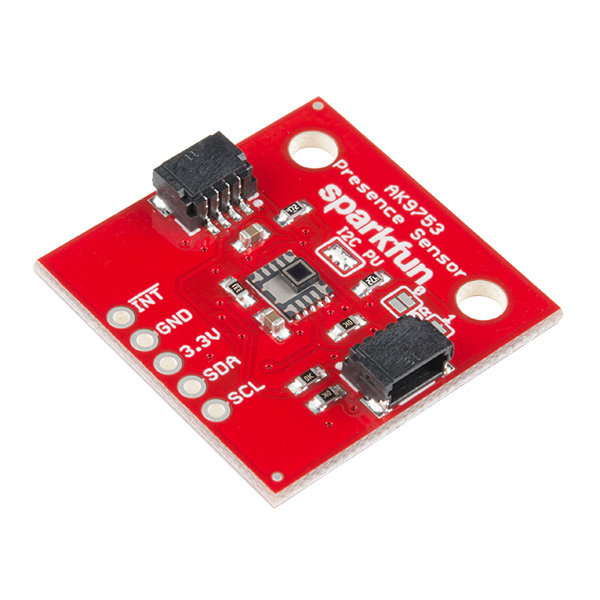 To make it even easier to use this breakout, all communication is enacted exclusively via I2C, utilizing our handy Qwiic system. However, we still have broken out 0.1" spaced pins in case you prefer to use a breadboard. 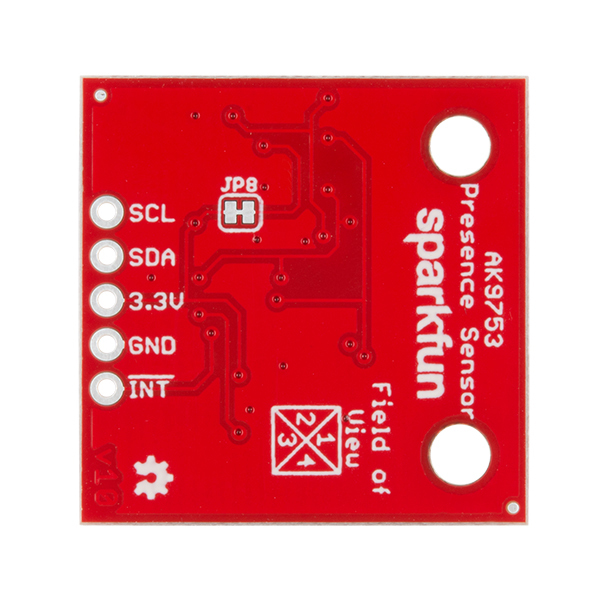 The onboard AK9753 is a digital sensor giving you a 16-bit digital value over I2C. Each of the four sensors outputs the IR current in pico-amps. A PIR reading can vary from roughly -200 (no human present) to 1500 when a human is detected standing in front of a given channel, but it varies due to environmental factors and other heat sources in view. 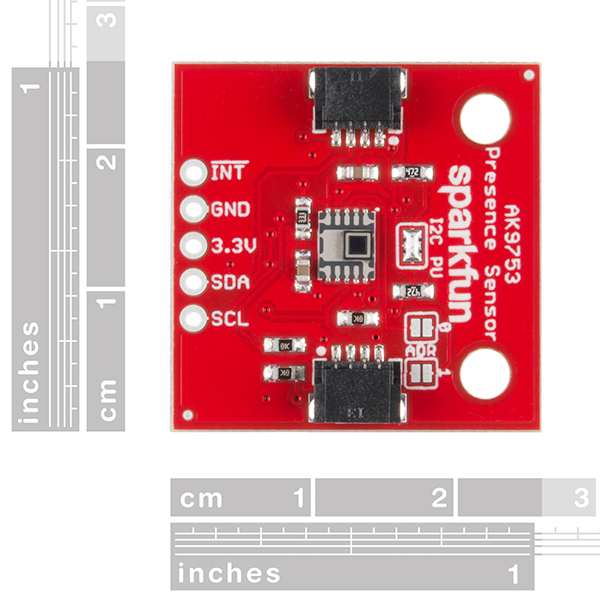 We’ve written a full library to control the sensor and included examples showing how to output the sensor readings you need, making this breakout even easier to handle! How to get started with your Qwiic enabled AK9753 Human Presence Sensor. I bought it without the quickness shield for Arduino. Can I use it without that? Novice and any help appreciated. It would be nice to have the lenses included so we can test the difference with and without. I'm not seeing much signal past like 1 meters for a normal person wearing clothes. I think the lens would help with the IR gain as the datasheet says. Is there a way to increase the Gain via code to increase the sensitivity? Where can get the lenses? Could you guys send me one, I bought the sensor. Can I use this sensor to get a rough estimate of distance from a human? Looking at the AKM website it appears that a lens is needed for this sensor to be effective at any distance. They list a W30 lens for wall mount applications. Is a lens included in this kit? Do you have this lens available? We don't have this lens available currently, but I did quite a bit of testing on the board with and without the lens and there was only a small increase in functionality with the lens added, and in most use cases, no increase in functionality, so we decided against gluing them on. Well, that is encouraging. At what distance were you able to get reliable human detection? If you want good measurements of people further out than 3-4 feet then you need the lens. The company who makes the lens will send you some but they are switching manufactures right now so the new lenses will be available in the future sometime. The cost for a single lens will probably be in the 3-6 dollar range. This is probably why Sparkfun did not include them or even attempt to order them since they come from a separate different manufacturer. I used a copper tube to get better distance but the lens is what you really want. The sensor works as it should otherwise just don't expect a meter of range as it is sold. The device is easy to interface and writing an Arduino program (I used an ESP-01) is straight forward with the provided library. However, the sensor readings fluctuate a LOT and setting a single threshold for detecting when a human is present or not is a nightmare. My system consists of an ESP-01, an AK9753, a LiPo battery and a MCP1700-3302E (a 3.7V to 3.3V Low Dropout Positive Voltage Regulator). The software uses the AK9753 library and a MQTT library. The idea is for when someone enters the room, the ESP-01 sends an MQTT message to a broker to turn the lights on. Again, with the reading fluctuations, it is practically impossible to set a threshold for "human present". In my program, I included a piece of code to constantly (every minute) send the current readings to the broker so I can monitor an empty room, average the readings over time and choose a threshold. But the readings vary from -3500 all the way to -1000 for no apparent reason in 1-2 hours -- again, that is for an empty room, without any heat source or possible interferences. Since a human at about 0.5 to 1m distance causes an increase in the readings of about 1000 (e.g. if the empty room causes a reading of -3200, the same room now with a human standing 0.5m away would lead to approximately a -2200 reading), so, setting the threshold to, say, -2500, only works while the fluctuations don't randomly hit -2500. After that, the light starts to turn on/off without anybody in the room.